Lock in a great price for The Quies – rated 9.6 by recent guests! I really like the way it feels like a home from home. On our arrival we were warmly greeted and able to check into our room early. 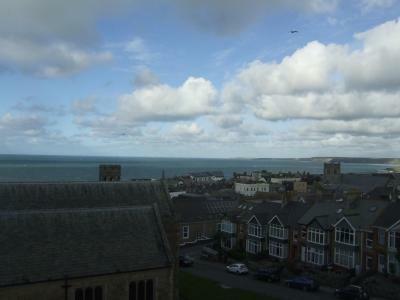 The guest house is centrally located and just a couple of minutes walk from the beach. Off street parking is available. We were shown the games room and dining area and told that we could bring a takeaway in if we so wished. Later that day we enjoyed a game of pool! Our room was spacious, well equipped and comfortable. We really couldn't have asked for more and it was great value for money too. We will be staying again! Very clean. Very comfortable. All the facilities you need. Free coffee and orange juice 24 hours and an honesty bar! Love it! Staff were incredible. Hotel and location was faultless! 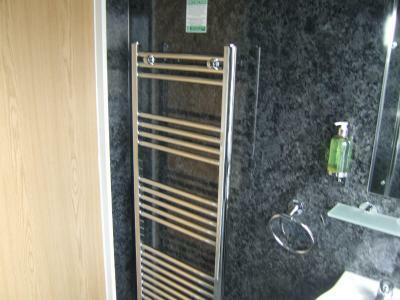 Very clean, new looking shower room. Pleasant room with everything you could need. Great games room with honesty bar. 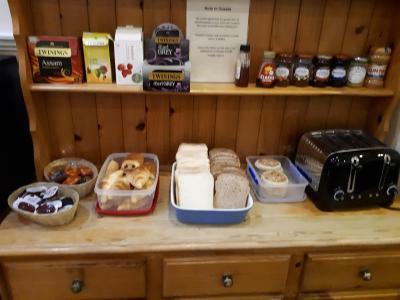 Free coffee and juice available to help yourself and well as kettle in room. Very friendly, helpful staff. Sitting room was fab. Room was lovely, really clean with a lovely new bathroom. Huge room, it was nice to spread out. It was wonderfully quiet, and i slept well. Excellent stay, fantastic staff. Great location, close to beach and shops. Brill breakfast the next morning. Large modern room and ensuite with sea view. Will go back again!! Games room and DVDs, honesty bar. The Quies This rating is a reflection of how the property compares to the industry standard when it comes to price, facilities and services available. It's based on a self-evaluation by the property. Use this rating to help choose your stay! 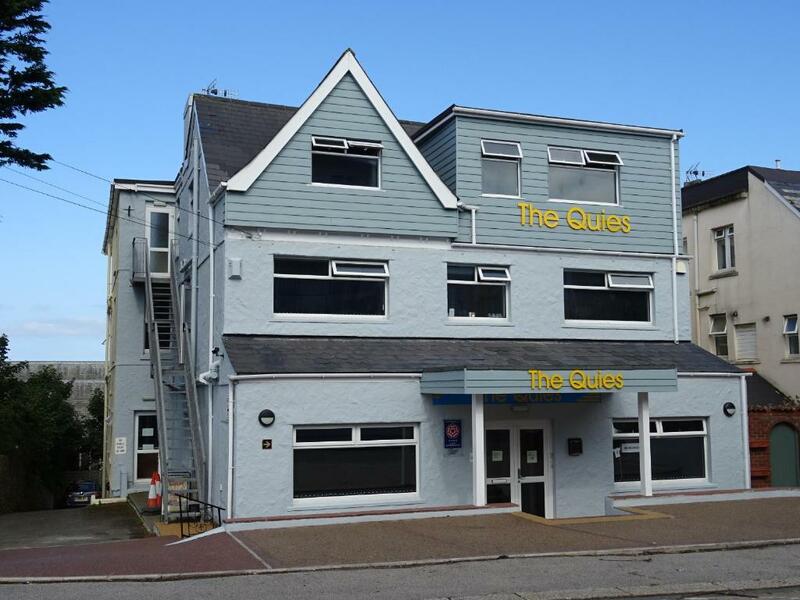 Just 2 minutes from Newquay town center an the beach, The Quies features a 4-star Silver Award for guest accommodations. 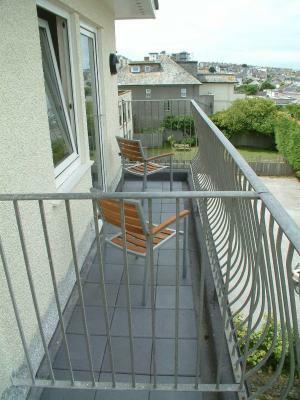 It also features a sun terrace, a games room, and refurbished rooms with sea views. The modern rooms offer stylish decor and private bathrooms. 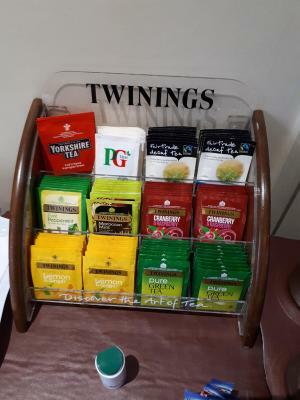 Rooms also have a hairdryer, TV and DVD player, and all feature tea and coffee facilities. Each room has air-conditioning and heating. A full English breakfast is served daily in the pleasant dining room, and secure indoor storage is available for surf boards and fishing equipment. There is also a PlayStation with free games and a DVD library available for guests. 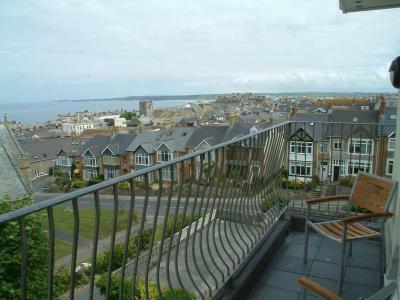 The Quies offers wonderful sea views from the spacious terrace. With Newquay Airport just 10 minutes away, The Quies is only 15 miles from The Eden Project. 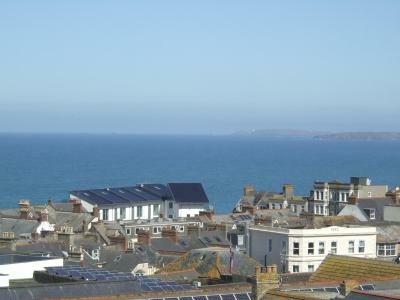 Newquay Golf Club is just a 10-minute walk away, and Newquay Railway Station is half a mile away. 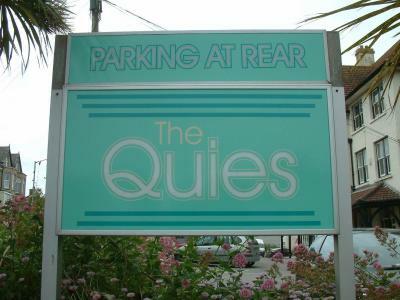 Limited free parking is available at The Quies. 뀐 Located in the top-rated area in Newquay, this property has an excellent location score of 9.5! When would you like to stay at The Quies? The room has an interconnecting door leading from the double room with attached bathroom into the children’s room with two single beds and color TV and DVD player. Tea/coffee making facilities are in the master room only. This room has double glazed windows. This room has air-conditioning and heating. This room is priced for 2 adults and 2 children under the age of 15. Twin room with attached bathroom. Towels are provided. This room has air-conditioning and heating. Four-poster en suite double room, ideal for that special occasion. This room does not have a sea view. Towels are provided. This room has air-conditioning and heating. This room is not suitable for babies and children. Double room with en suite/private facilities. This room has air-conditioning and heating. This room has air-conditioning and heating. Please note this room is on the 3rd Floor and there is no elevator. Located on the ground floor next to the main entrance door. Sea-view rooms are not available with this room type. This room has air-conditioning and heating. Please note that this room cannot accommodate any cot. Please note that this room cannot be made into a twin. This room is priced for 2 adults and 1 child under the age of 15. House Rules The Quies takes special requests – add in the next step! The Quies accepts these cards and reserves the right to temporarily hold an amount prior to arrival. Please note, this hotel cannot accommodate stag and hen parties. Please be aware that the free parking is limited. It operates on a first come, first served basis. Guests should note that the entire hotel is nonsmoking. Please notify the hotel if traveling with children. Please be aware that the hotel does not have a elevator. Please notify the hotel if you will need parking for a large vehicle, as space is limited and parking must be arranged. 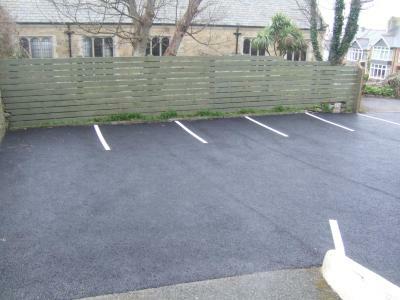 Although parking at the hotel was free it was really tricky getting into the car park. Really, really friendly and helpful staff. Large clean comfortable rooms with plenty of tea, coffee etc. Excellent breakfast with plenty of choice served by friendly staff. I would highly recommend this hotel. The situation of the hotel walking distance to shops and beach. The room we had was very spacious and comfortable. It was located at the bottom of the stair case to the upstairs rooms and had a fire door so every time somebody went upstairs it slammed shut banging which was annoying in the middle of the night waking us up. Room was excellent, plenty of room with TV and coffee making facility. Bed was very comfortable. 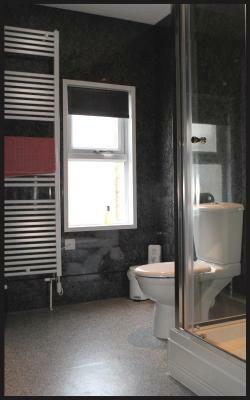 Excellent bathroom finished to a high specification, good water pressure. Breakfast was excellent, so much better than the local pubs. Good location, 3 minutes walk from town centre and all amenities. Can't fault it. We booked a last minute break at the Quies and immediately noticed the excellent reviews and the amazing price for 2 nights, we were not disappointed. The room was beautiful and clean, every little detail had been thought about. Alex greeted us on arrival and she could not have been any more welcoming and lovely. The location was excellent for walking into town or to the beaches, we didn't drive at all, walked along to fistral, lusty glaze, the boating lake, all sorts. We didn't opt to have breakfast purely on the basis that we like our lay ins and I have allergies! However, the option was there each morning if we changed our mind and I noticed allergy menus on every table which really is going above and beyond - those others with allergies will know what a hassle we always feel having to ask for an allergy menu and cause a fuss! 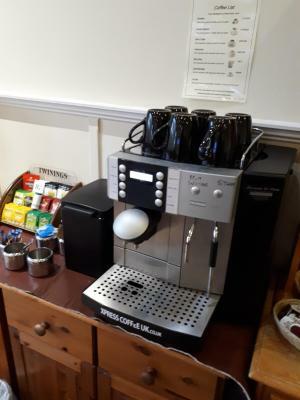 There was unlimited access to hot drinks and juice throughout our stay, as well as access to a huge collection of dvds to watch in our room if we wanted. We will definitely be booking again! Loved it! There was nothing I didn’t like..
That we couldn't stay for longer! The location, facilities and staff were all fantastic. Easy to get to with, albeit slightly cramped, free parking. The staff were all lovely and very helpful when we needed info. Really happy with our stay.